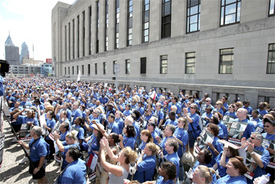 PHILADELPHIA — Chant-ing “Save Our Service,” members of the American Postal Workers Union rallied Aug. 17 during their national convention here to protest Postal Service plans to consolidate operations, eliminate union jobs, hire temporary workers and reduce service. Nearly 3,000 postal workers surrounded the old Philadelphia Processing and Distribution Center. The center is now mostly empty because the Postal Service moved operations and eliminated more than 700 jobs. Yet the new facility, like the former one, will process 7 million pieces of mail daily. “The service clearly has deteriorated,” said Harmon Elliott, president of the Philadelphia area local. He noted that it is not unusual for mail to take 7-10 days to travel from one destination to another within the city. Several other workers employed at the new center told the rally of frequent equipment breakdown and unreliable technology, which disrupts service. A spokesperson for the Postal Service in Philadelphia said it is in compliance with the contract and whatever problems there had been have been solved. The APWU strongly disagreed. The problems caused by consolidation go well beyond Philadelphia, Postal Workers leaders said. Timely and reliable mail delivery is important to every American, and critical to maintaining democracy, they added. Jeff Renfroe, an APWU steward, said, “It is our fear that management is trying to privatize.” Republican members of Congress have been pushing for privatization of the Postal Service for a long time, he added. Rep. William Lacy Clay (D-Mo. ), a member of the House committee that writes postal legislation, attacked USPS consolidation efforts head-on. “It’s outrageous that the Postmaster General wants to eliminate 139 facilities,” he said in a speech to union delegates. Consolidating operations means that mail will be transported outside the community for sorting before being returned for local delivery. If the plan is put into effect, the union predicts further deterioration in service, including week-long delays and deliveries taking place later in the day — sometimes even in the evening. PWW’s Rosita Johnson and Barb Kucera of Workday Minnesota and Press Associates contributed to this story.